Do you want straighter teeth, but you dread the idea of having metal mouth for years? Well, there is a solution that can get you the results you’re looking for without the brackets, wire, and frequent painful adjustment appointments. 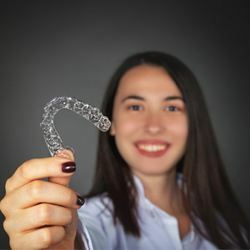 Our dentists here at Dental Dynamics offer Invisalign Clear Braces, which can give you the confidence to smile even throughout your treatment. Let one of our experts create your perfect treatment plan and get you on the right path to straighter teeth. Traditional braces use tension in the wire to slowly force your teeth to move. In contrast, Invisalign uses clear plastic aligners that comfortably and gently guide your teeth into a straighter position. For the best results, the clear aligners should be worn between 20 and 22 hours every day. Every two weeks, you receive new trays, bringing you one step closer to the smile you’ve always dreamed of. Invisalign works faster. While traditional braces can take up between 24 and 36 months to achieve the final results, Invisalign only requires 12 to 18 months. The clear aligners are barely noticeable when worn. You can straighten your smile inconspicuously. The aligners are removeable. Traditional braces come with a list of foods that you need to avoid, but with Invisalign, you can enjoy all your favorite foods by simply removing the aligners before you eat and brushing your teeth before you put the aligners back in. You can easily follow your normal oral care routine. Metal braces require special upkeep and can be difficult to work around to keep your teeth clean and healthy. With Invisalign, you can still do your normal daily oral habits without brackets and wires getting in the way. 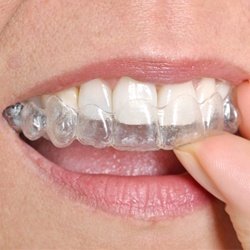 The clear aligners are easy to maintain. Every night, you only need to brush your clear aligners with your toothbrush and toothpaste and rinse them off. It’s that simple! Invisalign requires fewer adjustment appointments with the dentist than traditional braces. Every now and then, you’ll need to check in with your dentist to ensure that you’re on track with your treatment plan. Invisalign is affordable. It costs about the same as traditional braces for many patients. Our staff can work with you and your insurance, making Invisalign an affordable option for anyone. You can follow instructions. 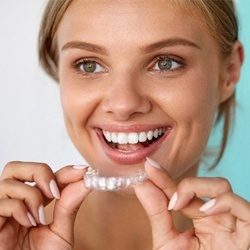 There are only a few “rules” for Invisalign, but they are important to keep. Otherwise the treatment could take longer or require more clear trays than expected, costing you more time and money. You can keep track of things. If you find that you or your teen loses things a lot, perhaps Invisalign isn’t the best choice. After all, you want to avoid extending treatment or having to go dumpster diving for the clear aligners. The best way to know whether Invisalign is right for you is by talking with one of our talented, experienced cosmetic dentists. Our dedicated team can help you choose the best solution for you. We look forward to helping you achieve the look you’ve always wanted for your smile. Contact us today to get started!